Home accidents are very common; some are worse than others because of safety issues and repairing cost. Flooding is probably one of the worst natural disasters that can happen to any house at any moment given. There are many causes for flooding besides natural disasters, and the repairing costs will also vary depending on the type of water that has entered your home. Here are the different types of flood waters and the impacts associated with the flooring, structural and electrical damages. White water flooding is when clean water floods into your home, due perhaps to a broken pipe or a massive rain storm. White water flooding is probably the most common type of flooding and certainly the easiest to clean. White water will usually not leave a huge mess behind since it is uncontaminated, unlike other types of flooding that will be described later on — although if not promptly dealt with, standing white water can quickly turn into standing grey water, or worse. Grey water is considered contaminated and can cause health complications for humans. The contamination can be from natural factors, or the sorts of chemicals come from everyday appliances such as sinks, washing machines or dishwashers. Grey water repair costs are higher than white water damage due to the different chemicals that may be present and the additional stains or damage those chemicals can cause. Just like white water, if grey water becomes stagnant for around two days it can be classified as black water. Any water that poses an immediate health risk to human beings or animals is considered black water. Strong chemicals can be found in this type of flooding, and it could contain soil or sewage contaminants. Having any unprotected contact with this sort of water can cause health risks since many diseases can be caught by just being around it without proper equipment. 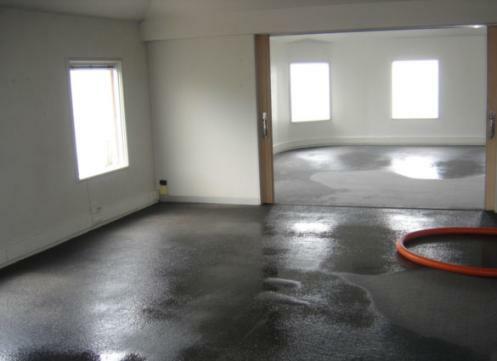 Though all types of water damage must be dealt with promptly to avoid further contamination, black water, in particular, must be cleaned up as soon as possible. Any damage to the infrastructure of the house is going to be very costly. It is of vital importance to make sure everything is treated quickly or the damages caused to walls and tiles will be irreparable. Keep in mind that the repair costs will not only have to include new paint, but some walls might have to be rebuilt entirely if the damage is too severe. If the walls are made of wood or drywall, then there will be no question that it must be removed and replaced. Some floors will receive more damage when exposed to water than others. Regular tile should not pose any problems since these are usually made of porcelain or natural clay composed. These floors should be checked to see if there is any mold between the tiles and the floor but may not have to be changed. Parquet flooring will most likely have to be replaced completely — this can be expensive because of the materials that will have to be replaced and the labor costs involved. It is safe to say that all the electrical appliances that have been in contact with water and the electrical installations themselves will have to be replaced. There is no way around this fact considering the high risks of something worse happening such as fire, which could be deadly and, of course, an even greater expense at an already difficult time. It is also important to keep in mind the fact that some walls will have to be opened up to reach the wires that go around the house, often compounding the cost of repairs. Flooding is something is a more common home disaster than we would like to think, so it is important to be able to identify the relevant factors as soon as it occurs. Being able to recognize which type of water has flooded your house is vital to prevent any extra damage to the building as well as to avoid any health hazards to humans and animals living in it. The costs can easily stack up — if you don’t already have a homeowner’s insurance policy to help cover these kinds of catastrophes, check out www.insuranceland.org for more information. Lautaro Martinez is a freelance writer and small business operator who provides articles and opinions on the issues faced both on the business front and at home, providing valuable and cost-saving insights on the problems he’s faced — and any of us might.